Three weeks after the release of Nintendo DSi, AceKard Team posted a video on their Youtube channel boasting the then experimental Acekard 2 flash cart. A week later, they introduced AceKard 2i DSi Flash Card, the first flash card to bypass Nintendo’s new update system and go commercial. So it wasn't a big surprise for us that it took only a couple of days for the AceKard team to crack Nintendo 3DS, and now with patch files released AK2i can turn into AceKard 3. Running a single update file is all it takes to make Acekard 3DS compatible! The first thing to do after you get your item is to visit the AceKard website and download the latest version of loader files. Extract the files to the root of the MicroSD and you can now start to drag and drop your homebrew, ROMs, images, movies, and MP3s. 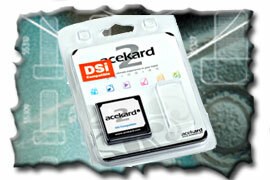 Stick your micro SD to the AceKard2i and insert the flash cart into your DSi. Your DSi is hot swappable so you can insert the flash cart even while the power is on. The first boot takes a little time to create save file but the loader time gets faster after the save file is created. Perfect compatibility. No flash or conversion needed. Support MicroSDHC / any MicroSD card. Can be used as a DS Passme to boot from Slot-2 flash carts. If you’ve been a fan of AceKard products, you might recognize that AceKard 2i’s menu looks pretty much like AceKard 2 and RPG. The bottom screen shows you the two slots for both micro SD and GBA. There is no Slot2 in DSi so the GBA slot will only work on NDS and DS Lite. At the top screen you see the time, date and mini calendar. Users have the option to control the entire OS by either the touch screen or the buttons. If you prefer to use the touch screen, scrolling speed can be configured. Every file and folder can be easily distinguished by its icon and name. Softwares will display their icon directly. You can even configure if you want to show hidden files. The media player works well as long as the ‘Download Play’ option is enabled in the Patches menu. Playing over the internet (Wi-Fi) works fine in all the games tested. AceKard 2i skins are available for use on the cart as it uses the same loader as the RPG and AceKard 2. Just download your favorite skins from AceKard’s website. Users can enjoy customizing graphics. The flash cart even lets you rearrange fonts on the screen and info placement. Acekard 2i DSi Flash Card support high capacity SD card and offer unlimited space for you. You do not need to worry about the speed of the card as it can meet any brand of MicroSD card. Acekard 2i saves your file in RAW format on your MicroSD and writes over it directly. All the save files are compatible with other flash carts. Enable this option and you can return to AK2 menu without turning off and on your DSi. The trimming function will automatically trim any unnecessary data when yo copy a file in Micro SD. Organizing your data is as simple as a touch by the build-in file operation that allows you to copy, paste and delete files in your Micro SD card. Full homebrew support, 100 % compatibility with all DS games, solid structure, and updateable firmware, what can you ask for more? Maybe some extra features like real-time saves, slow motion, and a nicer-looking interface for the media player. But even without the above mentioned extras, AceKard 2i DSi flash card is a terrific buy to play all your homebrew and DS games alike.